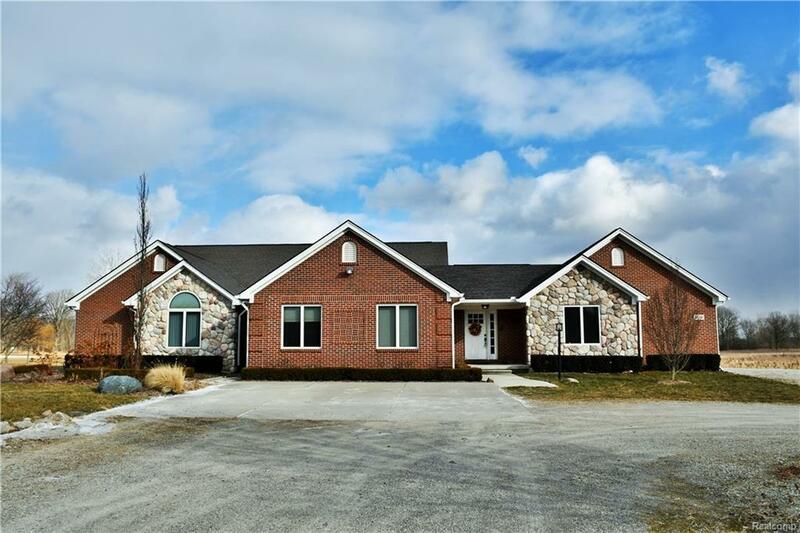 58440 Ray Center Rd, Ray Twp, MI.| MLS# 21561526 | Key Elite Realty | Macomb County Real Estate | Oakland County Real Estate | Call us at 586-286-1028 | Homes for Sale, Agents, Homes for sale in Macomb County. THIS IS THE HOME YOU HAVE BEEN LOOKING AND WAITING TO FIND IN RAY TWP. UPDATED/RENOVATED 3000 SQ FT RANCH OFFERING 5 BEDROOMS, 3 1/2 BATHS. THIS SPRAWLING HOME HAS SURPRISES AROUND EVERY TURN. KITCHEN, DINING & FAMILY ROOM ARE OPEN SPACE. KITCHEN IS GRANITE & CORIAN W/ HARDWOOD & S S APPLIANCES. FAMILY ROOM IS SPACIOUS, OFFERING HARDWOOD FLOORS, NATURAL WOOD BURNING FIREPLACE COMPLETE IN BEAUTIFUL STONE. YOU WON&apos;T WANT TO LEAVE YOUR MASTER RETREAT. THIS SUITE HAS THE FINISHING. FABULOUS TRIM & WOOD FLOORS, EN SUITE YOU WON&apos;T BELIEVE. SOAKING TUB, STYLISH SHOWER, & PERFECT CHANGING ROOM. LIVING ROOM IS BRIGHT W/ BAR AREA. VAST FINISHED DAYLIGHT L L INCLUDES POSSIBLE 5TH BEDROOM, KITCHEN/SERVING AREA, INCREDIBLE AREA FOR THEATER, HOBBIES, ANYTHING! NEXT IS YOUR OUTDOOR SPACE, 9 ACRES. WALK OUT THE BACK DOOR TO THE INGROUND POOL AND FIRE PIT. PERFECT FOR HORSES, PASTURES, BIKES. LARGE UNIQUE BARN FOR THE TOYS! BUYERS AGENT MUST BE PRESENT FOR ALL SHOWINGS. BATVAI.